The Fairchild AT-21 was an American World War II specialized bomber crew trainer, intended to train crews in the use of power gun turrets or a gun on a flexible mount, as well as learn to function as a member of a crew. It had a brief career as a training aircraft before modified bombers took over this role. 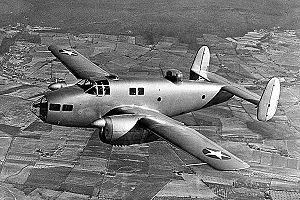 The United States Army Air Forces (USAAF) laid out a specification for a specialized bomber trainer, ordering two prototypes from Fairchild Aircraft. The XAT-13 powered by two 450 hp (336 kW) Pratt & Whitney R-1340-AN-1 radial engines, emerged as a "scaled down" bomber with a single machine gun in the glazed nose and a top turret with twin machine guns and fitted with tricycle landing gear. The concept was to have a single type that was able to duplicate the bomber crew positions from piloting, navigation, bomb aiming/dropping to aerial gunnery. The second prototype, designated the XAT-14 was similar in layout but was powered by two 520 hp (388 kW) Ranger V-770 inline engines. The Ranger V-770 is an inverted 12 cylinder vee type aero engine. A further refinement to suit the aircraft for bombardier training with the nose gun and turret removed, led to a new designation, the XAT-14A. Both prototypes featured an unusual construction, being built from "Duramold" plastic-bonded plywood. At the end of the testing period, the USAAC ordered the inline version as the AT-21 Gunner, specialized for gunnery training. The AT-21 had a crew of five, pilot, co-pilot/gunnery instructor and three pupils. Fairchild Aircraft Company built one aircraft in Hagerstown and 106 aircraft at their Burlington, North Carolina plant in 1943 and 1944, while Bellanca Aircraft built 39 at New Castle, Delaware, and McDonnell built 30 aircraft at their St. Louis plant, both companies were enlisted to speed production and delivery to training units. The AT-21 proved to be unsuitable for use as a trainer due to vibration and oscillation tendencies as well as an inherent instability caused by the short distance between the rudders and the gull wing resulting in unacceptable yaw even when slight rudder movements were made. Not deemed suitable for its original purpose, The AT-21 was evaluated as an advanced pilot trainer. This did not work out well due to poor single engine performance and multiple gear problems. The aircraft was withdrawn from service in 1944 and was replaced by training examples of the actual aircraft in which the gunners would eventually serve. Many of the AT-21s were then relegated to target-tow duties. A small number of AT-21s survived as civilian examples, with one (s/n 42-48053 owned by Craig Cantwell) still in existence in North Texas as a "basket case" awaiting restoration. In October 1942, the U.S. Army Air Forces ordered two XBQ-3 "aerial torpedoes", based on the AT-21 design. Optionally piloted for flight testing and capable of carrying 4,000 pounds (1,800 kg) of explosive, the XBQ-3 first flew in July 1944, but the project was cancelled later that year. XAT-14 modified as a bombardier trainer with dorsal turret and nose gun removed. Production version of the XAT-14A with two 520 hp (388 kW) Ranger V-770-11 or -15 engines, 164 built. Guided bomb version, AT-21 modified with 4,000-pound (1,800 kg) explosive charge in fuselage. Andrade, John M. U.S. Military Aircraft Designations and Serials since 1909. Hinckley, England: Midland Counties Publications, 1979, ISBN 0-904597-22-9. Swanborough, F.G. and Peter M. Bowers. United States Military Aircraft Since 1909. New York: Putnam, 1964. ISBN 0-85177-816-X. Taylor, Michael J.H. Jane's Encyclopedia of Aviation Vol. 3. London: Studio Editions, 1989. ISBN 0-517-10316-8.